Monitor on Massacre Marketing: The Sniped Tykes of Misrata? The last few days, April 14-16, have however seen a brutal new offensive by the government's forces besieging Misrata, by rebel reports, with a few dozen more killed in rocket attacks on Misrata, indiscriminately including women, children, and elderly. Cluster bombs have reportedly been found. The harbor was attacked again. The rebels predict a total slaughter will finally befall them without more NATO involvement soon. What they really mean is Misrata will no longer be a rebel town. UNICEF, the United Nations wing for caring about children's health and well-being, was naturally alarmed enough by these reports to announce they existed but weren’t verified – they’d go and have a look and then, perhaps, we’d hear about corroboration. The hefty bullet is shown in a vial, and a precious little girl is shown curled up asleep in the hospital bed, barely saved from the government's mad designs. 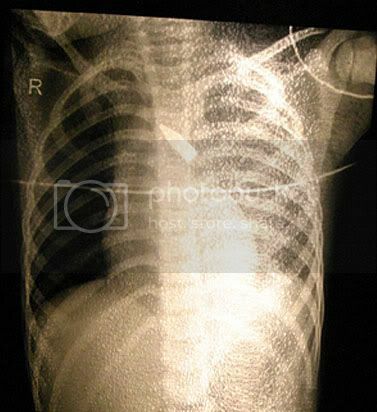 And as proof the two were once together, her x-ray is also shown to the camera. 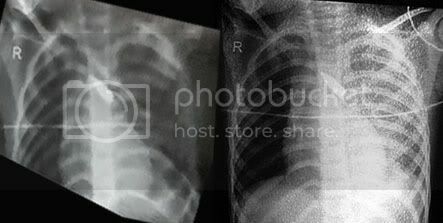 A rib cage is visible, with a bullet appearing in the upper center (top image). 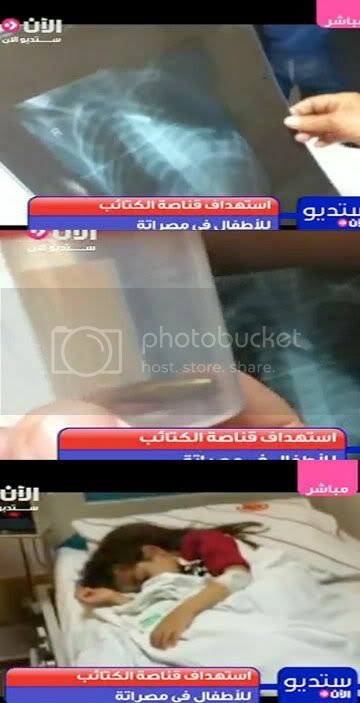 That looks like medical proof she was shot by someone or other. And certainly the whole medical clinic setting lends credence to it. This might sound strange, but is remarkably akin to what happened to WPC Yvonne Fletcher in London, 1984. Standing across from the Libyan embassy, she was shot by a high-powered bullet that entered the right shoulder at a steep angle, hit the heart, lung, and other vital organs, and passed out her lower left rib cage. She died from all this within short order, but from the outside, she just collapsed, with no visible blood and officers at first acting as if she'd just fainted. Gaddafi thug snipers pulled the trigger, it was decided, in both of these cases. Women and children were slaughtered, publics enraged. We have a precedent. It’s the same image, I can safely say, (aside from the circled left shoulder in Rakan's print). See the comparison at left, complicated by low-resolution video, the different angles of view, and different backgrounds behind the translucent images (these are all corrected somewhat for the left image). Clearly they are too consistent to be anything other than the same, so this is of course my source for the above blow-up of the little girl’s chest shot. The image could still be of a genuine child shooting, as my pathologist friend Rolfe at the JREF forum points out, but as she also notes with basic logic, it can’t be evidence for both of those kids being shot. Nonetheless, it was presented within the same few-days span as just that. It should of course be noted that this doubling up is enough to change “child” to “children,” and leave the public imagining just how many. Imaginations over here tend to ignore the "reported" part and presume hundreds of things like this. 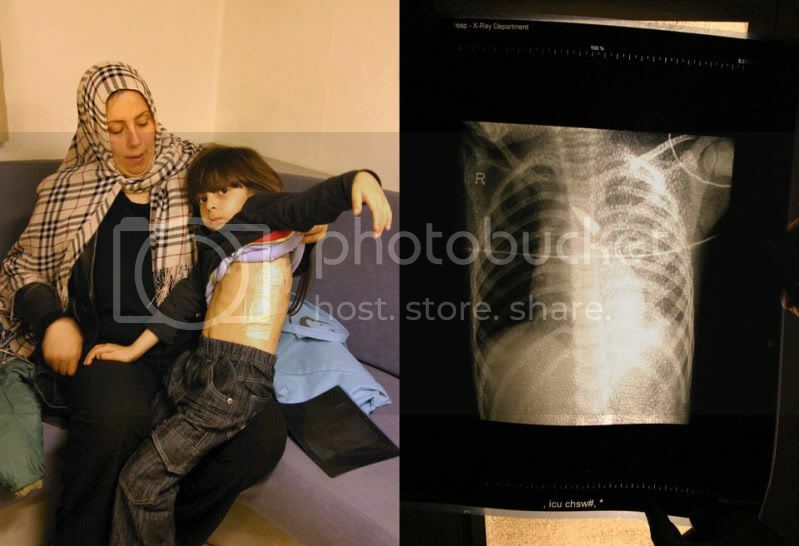 But we have this kind of evidence for only two, one recovering in Turkey, the other all healed up in Misrata, neither with a single broken rib, judging by the single x-ray image between them. All I can say is I'm glad the rebels are still able to fake these things in Photoshop and have it believed. If the international agencies like UNICEF and HRW were more exacting, we might see rebels actually shooting each others' children to leverage stronger support for regime change efforts. At the moment, I wish Gaddafi would just step down and hand his country over to Wall Street and these manipulative little domestic proxies so this absurdity can finally stop. Interesting how this never got a single comment here. It also appears low in a Google search compared to the original posting at my old site or to re-postings elsewhere. husband of daughter maqrif : Asma Magariaf@LibyanBentBladi. Something’s fishy here, and, as you suspected, it’s all connected … to the United States Government. LibyaFeb17 and EnoughGaddafi are pushed by Movements.org, the web site of an Alliance of Youth Movements. It was launched by, and funded by, the State Department in 2008 with corporate sponsors including Facebook, Howcast, MTV, Google, YouTube, AT&T, Pepsi, CBS News, MSNBC, JetBlue, Gen-Next and Access 360 Media, as well as Columbia Law School (see graphic, right). The Alliance’s 2009 Summit was addressed by Hillary Clinton, heard papers such as one by State Department official Jared Cohen (now Director of Google Ideas) on “Moldova’s Twitterrevolution,” and included such “youth movements” as the Teheran Bureau, Un Millón de Voces contra las FARC (Colombia) and the Movimiento Joven de Venezuela which has been active against the government of Hugo Chávez. These are “youth movements” made to the measure, and on the orders, of imperialism. 1, 2, 3, Down Sarkozy! 1, 2, 3, Up Gaddafi! Desperate for Recognition / Gambia? Gaddafi Attacking Europe With Refugees!!!! A Great Victory for Brother Gaddafi!